Three Usages of "The Kingdom of Heaven"
The kingdom is a major theme of scripture. It occupies a large place among the Old Testament prophets, and the teaching of John the Baptist and Christ. Not surprisingly, significant confusion about the kingdom has always existed. Part of the reason for the confusion is that the phrases “kingdom of heaven” and “kingdom of God” are used in several different ways. In this article, we want to identify the different usages in scripture and provide explanations and examples of each. Scripture uses the phrase “kingdom of heaven” (or God) three different ways: 1) the place of God’s habitation and the saints’ eternal rest; 2) the church, or those who obtain citizenship and inheritance in heaven; and 3) the dominion over all people, nations, and tongues Christ received at his ascension and coronation. Let’s take a look at these each in order. Apart from metaphoric use to describe governments and rulers, there are three usages of “heaven” in scripture; one refers to the kingdom of heaven. The three usages of heaven in scripture are: the firmament in which the birds fly; the firmament in which the stars are fixed; and the realm of the spirit, including Hades Paradise and Heaven, the dwelling place of God. The outer space beyond earth’s atmosphere may be called the “second heaven.” The “third heaven” is the place of God’s habitation (Eccl. 5:2) and the place of his throne (Ps. 11:4; Isa. 66:1). It is also called the “highest heaven” (Deut. 10:14) and the “heaven of heavens” (II Chron. 6:18). Paul refers to the third heaven by name in II Cor. 12:1-4, where he makes it include Hades Paradise, the interim abode of the righteous dead, and where Jesus went when he died (Lk. 23:43; Jn. 20:17; Acts 2:27). The lesson of this verse is that which is gross and palpable cannot inherit that which is ethereal, unless it first put off the physical and be made spiritual. Paul indicates that this occurs for each of us as we are called out of this world one by one at the last trumpet marking our physical death (I Cor. 15:51, 52; II Cor. 5:4-8). The sum of these passages shows that the “kingdom of heaven” and “kingdom of God” sometimes refer to the habitation of God and the place of the saints’ eternal inheritance. Jesus received dominion over earth as absolute monarch at his ascension, and now rules the nations with a rod of iron. He guides all things for the advancement of the gospel and the church. Christ’s dominion means that his church also has dominion and is a type of kingdom on earth. This is clear from the book of Daniel. The book of Daniel was written and complied while the Jewish nation was in captivity in Babylon for its sin and rebellion. God had delivered all nations of the civilized world into the power of Nebuchadnezzar, king of Babylon. God showed Nebuchadnezzar in a dream that his kingdom was to be the first of four successive world empires until the coming of Christ and his kingdom. Nebuchadnezzar saw a dream in which these four empires were represented by an image of a man, divided into four parts, each part consisting of a different metal. The head of was of gold; the chest and arms of silver; the belly and thighs were bronze; the legs were of iron and the feet were partly of iron and partly clay. Nebuchadnezzar then saw a stone, cut out without human hand, strike the image upon its feet, reducing it to potsherds that were carried away by the wind; but the stone grew into a mountain and filled the whole earth. The dream was interpreted for Nebuchadnezzar by the prophet Daniel, who indicated that each of the three successive kingdoms following Nebuchadnezzar’s would be inferior to those preceding it, as reflected by the declining value of the metals and their position in the body. This inferiority did not consist in the size or power of the empire, for the empires that followed Babylon were larger and more powerful. Rather, the inferiority consisted in the diminishing glory of the kingdoms as represented by the increasing division of the sovereign power and the government’s policy and response to the people and worship of God. The metals become less precious as the sovereign power was divided and shared. They also become increasingly debased as the governments they represent were inimical to God and persecuted his people. Nebuchadnezzar was absolute monarch over earth and became a worshipper of the true and living God. He is therefore was portrayed as the image’s head of gold (Dan. 2:37, 38). However, in the empires that followed, the glory of the sovereign power was increasingly divided, and their governments opposed to the people and worship of God. Cyrus the Great and several of his successors were friendly to the faith, even helping rebuild Jerusalem and the temple, and financing its construction and sacrifices. However, the sovereign power was shared with the country’s nobles, many of whom resisted the worship of God, even causing rebuilding the temple to cease for a time (Ezra 4:5-24; Zech. 3:1, 2). The Mede-Persian Empire was therefore represented by the chest and arms of silver. The kingdom of the Greeks was the third world empire. It was divided into four parts at Alexander the Great’s death, and its monarchs were generally hostile to God’s people and worship. Ptolemy Philopater entered the Jerusalem temple and attempted to compel the Jews in Alexandria to abandon worship of God, and to annihilate the race from among his people. 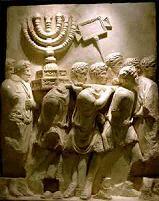 Antiochus Epiphanes carried the outrage still further, erecting an idol in the Jerusalem temple, defiling the altar and temple with swine’s blood, and putting to death Jews who refused to abandon the worship of God or circumcised their children. The kingdom of the Greeks was therefore represented by the belly and thighs of bronze. Rome was the fourth world empire. Dan. 7:7 says that Rome would be “diverse” from the preceding kingdoms. This almost certainly refers to Rome’s republican form of government, where the sovereign power was shared by the emperor, people, and senate, compared to the other world empires, each of which were monarchies. Rome is represented by legs of iron and feet of iron mingled with clay; the iron represents Roman government, the clay the subject peoples. Iron is the strongest, but the most corruptible of the metals. The feet of iron mingled with clay accords with the weakness and corruptibility of popular governments, and seems to signify Rome’s policy of direct rule of subject nations by presidents and procurators (“they shall mingle themselves with the seed of men,” Dan. 2:40-43). That is, where the other empires imposed tribute and allowed subject peoples to govern themselves, the Romans mingled themselves among the subject peoples by direct rule through Roman governors. This had the effect of imparting some of the iron strength of Roman rule, but it also contributed weakness, for iron and clay do not adhere to one another, and the Roman governors were greatly resented by the subject peoples (“they shall not cleave one to another, even as iron is not mixed with clay” Dan. 2:43). Thus, in Rome we find that the sovereign power was most divided (“the kingdom shall be divided” v. 41) and least glorious in terms of decent from monarchy to aristocracy to democracy, and Rome’s direct rule of subject peoples by presidents and procurators. In terms of resistance to God’s people and worship, Rome ranked first. Pilate was implicated in the murder of Christ and persecution over Stephen (John 19:19; Acts 8, 9; Rev. 12), and Nero was the world-wide, eschatological persecutor of God’s people whose name was synonymous with the “beast” (Rev. 13:18; 17:10). Thus, the kingdom of heaven sometimes refers to the church, the spiritual kingdom of Christ. We have seen that the phrase “kingdom of heaven” sometimes has in view the habitation of God and the place of the saint’s eternal inheritance; we have also seen that the phrase is used to describe the spiritual kingdom of the church. It remains only to show that the kingdom of heaven also describes the kingdom of Christ and that this entails 1) Christ’s government over earth’s nations, including judgment of the living and the dead, 2) that this reign is from the right hand of God in heaven, and 3) Christ’s dominion began as a matter of law at his ascension, but was not possessed as a matter of fact until Jesus put his enemies beneath his feet at his second coming in A.D. 66-70. It is sometimes supposed that language saying “all peoples, nations, and tongues” would serve Christ merely refers to the universal call of the gospel, and that men of all nations would convert to Christ. However, Christ’s kingdom can in no way be limited to the church; all men are subject to his rule. That Christ is king and governor over earth’s nations is attested by many passages of scripture. The dominion described here includes his enemies; hence, more is involved than the church. Christ’s kingdom is over earth and its nations. When we consider passages like these from the perspective of Jews living under Roman rule, it is not difficult to see why they supposed that the Messiah would be a national liberator who would vanquish Rome, and lead Israel to world power like the glory days of Solomon. However, they greatly mistook the case. Although Christ would save his people from the political oppression of their enemies, sin and death were far greater enemies, and it was these Jesus was principally concerned to destroy. Moreover, the promised salvation of God’s people did not belong to Israel alone, but was common to all men who come to Christ in faith. Since the gospel was universal in nature, the national institutions of the Old Testament would all be cast aside as obsolete, allowing Christianity to overtake the world. And since Christ was king over all men and nations under heaven, it was imperative that he reign from heaven. This brings us to the next section. Here scripture expressly states that Christ would rule from God’s right hand in heaven. Several New Testament passages describe this as being fulfilled in Christ’s ascension to heaven (Acts 2:33; Heb. 10:12, 13). When Jesus told his disciples shortly before his ascension “all power is given unto me in heaven and in earth” (Matt. 28:18), he alluded to his receipt of the kingdom and dominion. Peter said Christ “is gone into heaven, and is on the right hand of God; angels and authorities and powers being made subject unto him” (I Pet. 3:22). What this means for us is, that even though we do not see Christ seated upon David’s throne reigning from the heavenly Zion, we are told that it is an accomplished fact and may trust it implicitly. We have seen that Christ’s reign over earth’s nations is from heaven. Jesus received this kingdom and dominion as a matter of law at his ascension and coronation. But it was not his as a matter of fact until he put his enemies beneath is feet in the events of A.D. 66-70. The case is analogous to Herod the Great, who sailed to Rome where he was made king by the Roman senate, but was three years defeating his enemies and bringing his kingdom into subjection. Herod received the kingdom as a matter of law from the Roman senate in the winter of 39 B.C., but it was not until the summer/fall of 36 B.C. that he subdued his enemies and made the kingdom his as a matter of fact. We believe scripture shows a similar pattern was true of Christ. It was then that Christ sat upon the throne of his glory and judgment of the living and dead began, and has continued ever since (Matt. 25:31-46, II Tim. 4:1; cf. Matt. 16:27, 28). Christ therefore is Lord of the living and dead, and rules the nations with a rod of iron. This does not mean the nations do not rebel; the very scriptures that predict Christ’s rule state the nations will rebel. But Christ rules them with an iron rod and chastens those that resist by visiting them with wars, famines, and other calamities, always guiding history for the advancement of the church and gospel. The kingdom of heaven is used three different ways in scripture: 1) The habitation of God and the place of the saints eternal rest; 2) the spiritual kingdom of the church; and 3) the dominion Christ received over earth’s nations and peoples at his ascension, but which he put beneath his feet at his second coming in A.D. 66-70. We believe Nebuchadnezzar was a type of Christ, similar to Solomon, in his rule over all earth as absolute monarch. Nebuchadnezzar’s kingdom thus served as a foreshadow and adumbration of Christ’s kingdom. Dio Cassius, LIII, ii-xii; Loeb ed. Thomas Marris Taylor, A Constitutional and Political History of Rome (Metheun & Co., London, 1889), 464.